NFL Rumors: Jon Gruden Preparing for Return to Coaching? The NFL coaching carousel has yet to officially begin but the rumors certainly have. The most recent rumors involve current Monday Night Football analyst Jon Gruden. According to Ian Rapoport, Gruden is reaching out to assistant coaches around the league as if he were going to assemble a coaching staff for next season. That has led many to speculate that Gruden is finally ready to leave the broadcast booth and return to the sidelines. Rapoport goes on to say that Gruden would prefer to make his return to coaching in Tampa Bay. Gruden was the head coach of the Buccaneers from 2002 to 2008, leading them to a win in Super Bowl XXXVII. Earlier this month, Gruden was inducted into the Bucs’ Ring of Honor. He remains a beloved figure in Tampa Bay after his seven seasons as head coach of the Bucs. Of course, the Buccaneers still have a head coach in Dirk Koetter. However, it wouldn’t be a surprise to see Tampa Bay move on from Koetter after the season. After going 9-7 a year ago and being on the verge of the playoffs, the Buccaneers have taken a big step backward this season. Entering Week 16, the Bucs are 4-10 and last place in the NFC South. They failed to have the breakout season that many envisioned for them prior to the season. Even if the Bucs end up firing Koetter after the season, there’s nothing to indicate that Gruden would be at the top of their wish list. For starters, it would take a massive amount of money to buy out Gruden’s contract with ESPN. His current contract runs through 2021, which could be a stumbling block if he wants to return to coaching. There’s also the issue that Gruden hasn’t coached in nearly a decade. Most of today’s players know him only as a broadcaster and not a Super Bowl-winning coach. Of course, that could explain why Gruden has been contacting assistant coaches. 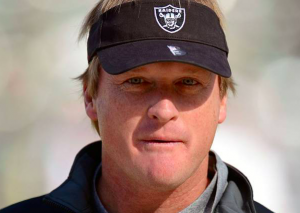 With a strong and experienced group of assistants, Gruden could potentially make an easy transition back to coaching. After all, Gruden’s name has been mentioned regularly with both NFL and college vacancies throughout his time in the broadcast booth. Right now, rumors and speculation are the only things connecting Gruden to a return to coaching. However, considering Tampa Bay’s trouble finding a successful head coach since Gruden left, it makes sense for them to be interested in a reunion. We’re still a couple weeks from the coaching carousel getting started. But Jon Gruden returning to Tampa Bay is not the craziest coaching rumor we’re likely to hear. There’s definitely a chance for this rumor to heat up in the weeks ahead.